Poland unveiled their solar powered illuminating bikepath on September 23. Located near Lidzbark Warminski in the Mazury region, the path was developed by TPA Instytut Badan Technicznych in Pruszkow and is 100 meters long. Still in the test phase, TPA President and CEO Igor Ruttmar has said they plan to test the short section of path to determine how it endures the winter, and then create a plan to make it longer. The path illuminates at night. It is built with blue luminophores, which are a synthetic material that emits light after being charged by the sun. Think of the glow in the dark stars you use to have above your bed as a kid – it’s like that but on a mass scale. The light lasts around 10 hours, theoretically until the sun rises again. 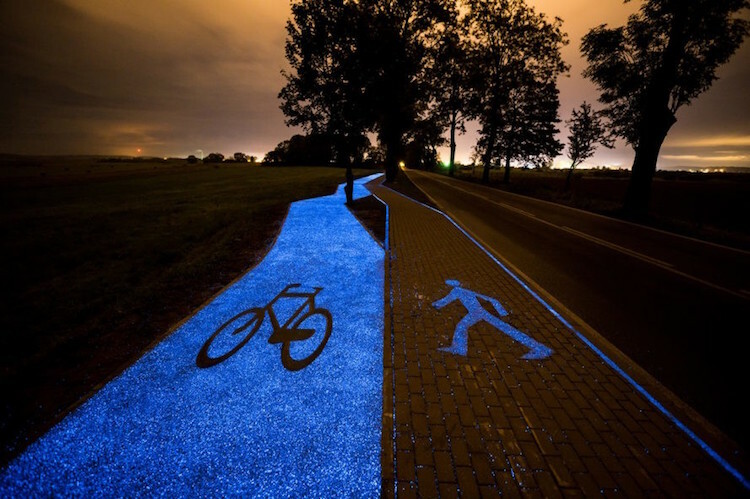 The inpsiration for the path came from the Netherlands “Starry Night” bikelane, which was unveiled 2 years ago. They use solar powered LEDs to create a path that reflects Vincent van Gogh’s work. The Polish bikepath takes this one step further. Their path is entirely self-sufficient, with the sun the only source of energy required. We’re excited to see how this idea could transform public areas. Roads could be built using the sun and vibrations to power streetlights or to luminate the road in a similar way. This idea is not new; Daan Roosegarde proposed an energy-saving “smart” highway; an electromagnetic roadway was proposed in China; and a piezoelectric road similar to Roosegarde’s was proposed in Israel. Renewable energy is on the up and up.